Stock #DESIGNERCOLLECTION2640ZYXPT: Platinum Diamond Engagement Ring with Round & Princess Cut Diamonds with approx 2.0 carats total weight for $6450.00. This ring comes with a professional Third Party Appraisal. Stock #DESIGNERCOLLECTION2640ZYXWBPT: Platinum Diamond Wedding Ring with Princess Cut Diamonds with approx 1.25 carats total weight for $2850.00. This ring comes with a professional Third Party Appraisal. Stock #DESIGNERCOLLECTION2640ZYXGO: 14K White or Yellow Gold Diamond Engagement Ring with Round & Princess Cut Diamonds with approx 2.0 carats total weight for $2650.00. This ring comes with a professional Third Party Appraisal. Stock #DESIGNERCOLLECTION2640ZYXWBGO: 14K White or Yellow Gold Diamond Wedding Ring with Princess Cut Diamonds with approx 1.25 carats total weight for $6250.00. This ring comes with a professional Third Party Appraisal. Stock #DESIGNERCOLLECTION2641ZYXPT: Platinum Diamond Engagement Ring with Round & Princess Cut Diamonds with approx 2.50 carats total weight for $9950.00. This ring comes with a professional Third Party Appraisal. Stock #DESIGNERCOLLECTION2641ZYXWBPT: Platinum Diamond Wedding Ring with Princess Cut Diamonds with approx 1.50 carats total weight for $3450.00. This ring comes with a professional Third Party Appraisal. 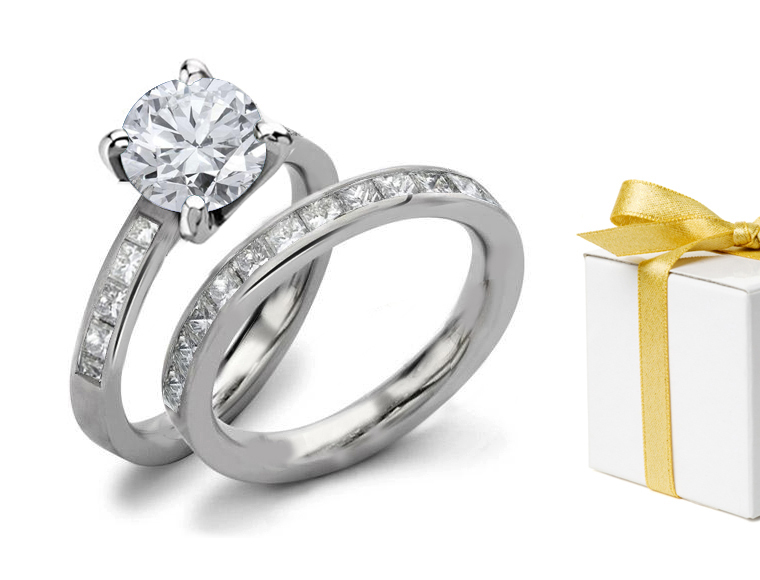 Stock #DESIGNERCOLLECTION2641ZYXGO: 14K White or Yellow Gold Diamond Engagement Ring with Round & Princess Cut Diamonds with approx 2.50 carats total weight for $9750.00. This ring comes with a professional Third Party Appraisal. Stock #DESIGNERCOLLECTION2641ZYXWBGO: 14K White or Yellow Gold Diamond Wedding Ring with Princess Cut Diamonds with approx 1.50 carats total weight for $3250.00. This ring comes with a professional Third Party Appraisal.